It’s almost time for the next season of the Two Month Review—our seventh season. (That’s a solid number.) 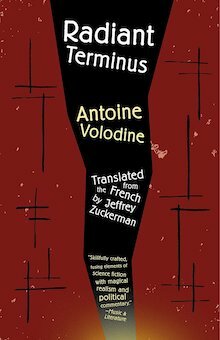 This season we’re returning to do an Open Letter title, Antoine Volodine’s Radiant Terminus, translated from the French by Jeffrey Zuckerman. Fantastical, unsettling, and occasionally funny, Radiant Terminus is a key entry in Volodine’s epic literary project that—with its broad landscape, ambitious vision, and interlocking characters and ideas—calls to mind the best of David Mitchell. For those of you who like to read along with these seasons—not entirely necessary! although I promise the jokes are funnier and the insights more insightful if you do—here’s the official reading schedule. I’m listing the podcast release dates below, but you should follow our YouTube channel (or Twitter) to find out about the live YouTube recordings, where you can ask questions, point out your own observations, correct things we got wrong, etc. So tune in next week for a general introduction to post-exoticism, Volodine’s pseudonyms, and much more. And then we’ll be back on 1/31 to talk about the opening sections of the book. Also, in case you haven’t already bought a copy from your local indie bookstore, you can use the code VOLODINE at checkout our site, and receive 30% Radiant Terminus or any other Volodine title. This is my first time trying this, and I wonder if I’m missing something. Are there episodes posted somewhere? Thanks! Hi Mark— This will all be explained in the YouTube video today, which will be released as a podcast later this afternoon, but you aren’t missing anything. Me, on the other hand, am missing my computer . . . It got lost in ABQ, which derailed our recording schedule for a few days . . .